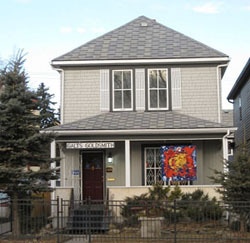 We are located on the corner of 14th Street and 21st Avenue SW in Calgary's inner city district of Bankview. Our premises was built close to a century ago and is one of only a few houses left from that era. You will recognize us by the artworks displayed at the front of the building. Parking is readily available on the avenue or in a reserved stall towards the back of the building.